The process of developing a management plan for the West Trail Study Area— encompassing Boulder’s mountain backdrop and everyone’s favorite trails and climbs—has now been going on for well over two years, and the results are scheduled to go to City Council next month, on March 15. 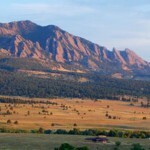 In addition to being viewed by most Boulder citizens as the heart of their open space system, the West TSA is the largest TSA, at 11,200 acres, has the most visitors, estimated at about 2 million a year, and has many entrances—51 formal access points, as well as thousands from residents’ back yards, from other public lands, or from roads. (Figures from OSMP documents.) Hence, developing a management plan was destined to be a complex and contentious undertaking. 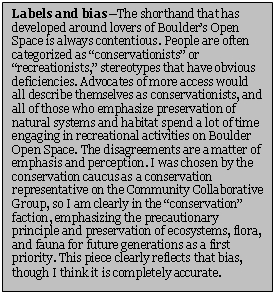 Boulderites love their open space, and they are quick to express their opinions on how it should be managed! 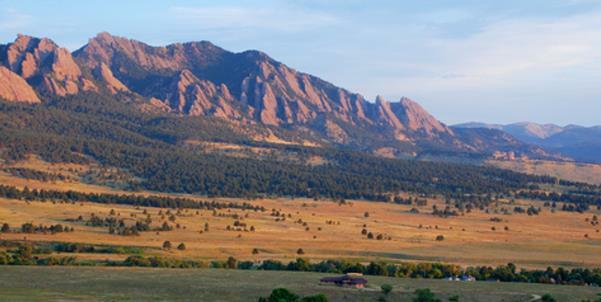 The history of Boulder’s open space and the West TSA is too long to cover here, but management issues have been with us since residents purchased what is now Chautauqua in 1898. 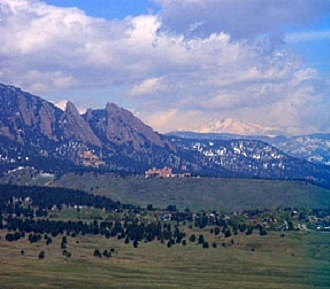 The emphasis in the Open Space Charter incorporated into the City Charter and approved by the voters in 1986 is preservation, but the stated goals also provide for passive recreation, and recreation has always been a major purpose of what was once the Boulder Mountain Parks, merged into the Open Space Department in 2001, because the purpose of the Mountain Parks was deemed to be that of open space, rather than parks and recreation. In developing management policies for open space, however, it was recognized that the sometimes conflicting demands of preservation and recreation needed to be resolved, and a long community discussion and debate, including two citizen advisory committees, resulted in the Visitor Master Plan (VMP), adopted by City Council in April 2005. The VMP provided for trail study areas to be covered area-by-area by more detailed management plans, and the first two completed were the Marshall Mesa-Southern Grasslands TSA (Dec. 2005) and the Eldorado Mountain-Doudy Draw TSA (Dec. 2006). These were basically developed by staff with input from interested parties, and public presentation and input at major decision points, a process that was time-consuming for staff, expensive for the department, and not viewed as completely satisfactory by anyone. Recreationists complained that their needs were not met, that the process was too cumbersome, that some segments received an inappropriate level of protection without any scientifically demonstrated need, and that some users were being shut out from land they had paid for through sales taxes. Dog Walkers complained that they were too restricted in the places they could hike with their dogs, particularly off-leash. Conservationists objected that the process began with users drawing lines on a map for their desired activities and that the natural resources had not been inventoried before laying out trails, nor were there plans to monitor impacts. Work on the West TSA was officially initiated with an Open Space Board of Trustees (OSBT) study session in September 2008, followed by a public meeting in October. Well before those events, Open Space and Mountain Parks (OSMP) began a substantially different and more thorough preparation for the TSA that covers the heart of the OSMP system—the West TSA. This is an area that is recognized worldwide as ecologically significant, and its recreational opportunities are treasured by Boulder citizens and visitors alike. Many residents of the area have a strong love for, and vested interest in, the West TSA. It arouses fierce loyalties and opinions from many points of view. By the time of the study session, OSMP had decided to start the process with a thorough inventory of the West TSA resources: natural, recreational, cultural/historical, and paleontological, and to come up with a planning model for using these inventories in the decision-making process and for measuring and managing the results. The methodology was well-documented in the Grassland Ecosystem Management Plan, developed in parallel with the start of the West TSA, and adopted by City Council in May 2010, and the resource documents themselves are available here. OSMP also struggled to come up with a more accelerated process for public input, while still achieving a process of community collaboration, hoping to get more community input of higher quality, while still achieving a faster review. Hope springs eternal! OSMP and OSBT ultimately agreed that the best way to approach the West TSA was to take a radically different process from the previous TSAs. They chose to convene a stakeholder group with representatives from many segments of the community to do the initial draft of the West TSA management plan, using an outside neutral facilitator, and operating under consensus rules—that is, the TSA plan would begin with a draft to which every single member of the CCG agreed. Any member could veto a proposal. The CCG did not have any decision-making authority. That authority remained with OSMP, the Open Space Board of Trustees, and finally with City Council. This was always made very clear, though some members of the CCG had difficulty accepting the fact. The CCG essentially had the task of presenting community input to OSMP and OSBT. There have been many arguments about the process as it proceeded; however, I think there is no question that the West TSA has had more extensive public input and involvement than either of the previous TSAs. There are various reasons, good and bad, but the community discussion has been intensive. Every CCG member has received hundreds of communications, each has communicated with her/his caucus, and every meeting has had provision for public input. A lot of this input has been documented, and much of it has not. Returning to the establishment of the process, OSMP hired a facilitator from the Keystone Group to assist. He contacted and interviewed a variety of interested community members and proposed the composition of the CCG, in an iterative discussion with OSMP staff and OSBT. In the end, OSBT decided that the CCG should be selected by caucus at a public meeting, where each member of the public decided on his/her primary interest, and the representatives were chosen to compose: 5 conservation representatives, 5 recreation representatives, 3 neighborhood representatives, 1 cultural/historical representative, and 2 representatives from OSMP, to be appointed by the department. Controversy over the caucus process led to a number of disputes, particularly over the selection of the neighborhood representatives. In the end, months later, two of the neighborhood representatives resigned and were replaced by their alternates, and the aftereffects contributed to the departure of the original facilitator. CCG meetings began in October 2009, and continued through 31 official meetings of 3-4 hours each over the next 16 months. In addition, there were countless communications with constituents, meetings with other CCG members, and meetings of subgroups. OSMP staff spent much of its time during this period supporting the CCG process. Do the results justify all this time and effort? Time will tell, depending on the contents of the final plan, the actions of City Council, and general community acceptance. Most importantly, we will see how well this unique area is sustained over the coming years and decades, based on implementation of the final plan. The original campaign for open space promised to preserve it for our children, and their children, and their children…. The success in fulfilling that promise will be the final verdict. The CCG finally produced a set of consensus recommendations in January of 2011, and the OSBT accepted those recommendations as a package. Undesignated (social) trails. One of the main tasks of the CCG was to make recommendations on all undesignated trails in the West TSA—either to designate them or recommend that they be closed and reclaimed. 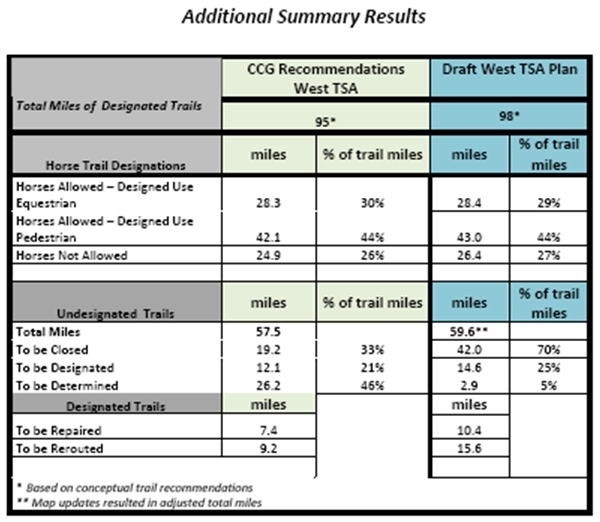 The CCG did, in fact, come to consensus on designating approximately 12 miles of social trails and closing about 19 miles (see the Additional Summary Results table below). Another 26 miles were left for staff to decide. Rerouting trails to improve habitat, sustainability, and visitor experience, and recommend sections for repair. The CCG recommended repair of about 7 miles of trails and rerouting of 9 miles of existing trails, in a number of cases significantly expanding highly suitable habitat blocks. Dog regulations. The Visitor Master Plan calls for an increase in opportunities for dog-free hiking. This was a particularly difficult goal, since 95% of the trails in the West TSA currently allow dogs, and the ones that don’t are far from the normal trailheads. Increasing dog-free opportunities, even a little, requires closing someone’s favorite trail to dogs. The CCG did manage to come to consensus on some recommendations, which increase dog-free opportunities, and increase both voice-and-sight and leashed dog walking opportunities. (See the table below.) The agreements on dog regulations were the result of many hours of difficult negotiations between the dog walker representative and conservation representatives. There has since been a split among dog advocates in the community over whether they support the agreements made by the CCG dog representative. OSBT and OSMP accepted that this package of agreements had to be accepted as a whole, lest it unravel. It remains to be seen whether City Council will agree. Horse regulations. The CCG agreed to a complicated package of horse regulations that is included in the draft plan. The City Charter allows equestrian use of open space where designated. The CCG recommendations fill in the designations, as required by the TSA process. Mountain bikes. The CCG did not come to consensus on whether mountain bikes should be allowed on trails in the West TSA. All the alternatives proposed by the mountain biking representative were considered in detail, however, and studied on the ground. One large public meeting was held, and in the end, the conservation representatives and two of the neighborhood representatives agreed that consensus would not be reached on the mountain bike proposal then on the table. According to the original charter for the CCG, all issues on which consensus was not reached would be decided by the OSMP department, so once the CCG recommendations were accepted by the OSBT, OSMP generated a draft that included all the CCG recommendations and made provisional decisions on the remaining issues. These included decisions on many remaining undesignated trails, several reroute decisions that were discussed extensively by the CCG, but that still needed to be resolved, and, of course, the issue of mountain bikes. The draft plan was released to the public on February 1, and OSBT held a public hearing on it a week later, followed by a study session with staff. Some of the statistical summaries of actions are included in the tables below, and the bike issue is discussed in the following section. The tables above are part of the memos from staff to the OSBT 2/9, available here. Mountain Bikes in the West TSA? The question of whether mountain bikes should be permitted on the trails in the West TSA was bound to be contentious. Indeed, mountain bikes were allowed on some of these trails in the early 1980s, and they were subsequently banned in 1987 as a result of conflicts with other users. I think it was always clear that this issue would end up being resolved by City Council. Continue to pursue an Eldorado Springs-Walker Ranch connection with other agencies and potential acquisition of private land. Mountain bikers all agree that this a very desirable connection, but they are reluctant to accept it as useful, since it relies on negotiations with other parties to reach fruition. Conservation groups have generally been supportive of the initiative. Pursue a connection from Boulder Canyon to the Flagstaff Saddle via Chapman Drive. Bikers have the same objection as above, but recent events have made achievement of this goal much more likely. Conservationists are also supportive of this alternative, with the proviso that bikes should be allowed on Chapman uphill-only, with descent via Flagstaff Road. Though the CCG did not come to consensus, it did carefully consider all the routes proposed by the mountain biking representative, Mark McIntyre, and by Guy Burgess, one of the neighborhood representatives. In the end, none of the proposed north-south routes proved to be workable, because they would have caused significant environmental damage, or because of user-conflict issues, or both. Some proposals also elicited substantial neighborhood opposition. There are two reasons that it is difficult to come up with a viable north-south bike route without unacceptable impact. The first is that the strip between the city boundary and the steep rocks to the west is narrow and interrupted by durable rock formations and sometimes by federal land. The second is that there is already a dense network of trails in our well-loved mountain front. These factors guarantee that any prospective route will fragment habitat, encounter fragile and valuable riparian corridors, and conflict with established hiking trails. The mountain bike community has since advocated strongly for other alternatives that it was not willing to consider before. These will be problematic and contentious, because they are last-minute, and they cannot receive adequate analysis or public input at this late date. February 1, The Draft West TSA Plan was released. It is available here. A supplementary document specifically addressing mountain bikes is here. February 9, OSBT meeting on Draft West TSA Plan was held at City Council Chambers, with well over 100 members of the public speaking, primarily on the mountain bike issue. Everyone who wished to speak had an opportunity. February 10, OSBT Study Session with Staff on the Draft Plan at the East Community Center. Public meeting with no public input. OSBT requested clarification/further study on a number of points. Friday, February 18, final West TSA Plan is due to be released. It should be available at westtsa.org. Wednesday, February 23, OSBT Meeting to act on Final West TSA Plan, there will be a public comment opportunity, at Boulder City Council Chambers. Tuesday, March 15, (and Wednesday, March 16?) City Council Meeting to consider West TSA Plan. There will be public input on 3/15. City Council could take several routes, depending on whether it wants changes, but at least one more meeting on the plan is likely, probably on the next night. Anemone Hill: Does It Need an Obituary?